"70. Failure to give notice in due time does not of itself mean that the hearsay evidence in question is inadmissible, but it is relevant to (i) the court’s exercise of its case management powers and (ii) the weight to be given to the evidence. So far as (i) is concerned, CPR r. 32.1 gives the court a discretion to exclude admissible evidence. That discretion may properly be exercised to refuse to admit hearsay evidence where there is a failure to comply with the specified time limit". "They do not speak for themselves, even when read with the benefit of the technical education I have received during the course of this trial". 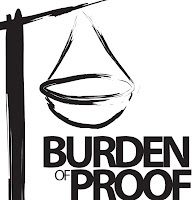 "Recently I was researching the provisions concerning the reversal of the burden of proof in diffrent jurisdictions and, to my surprise, I found that the ability to request reversal of burden of proof is not as simple as it may be thought or "advertised" in the matter of process patents. In fact,the patentee has to satisfy specific conditions (see for example, Section 100 of UK Patents Act in the UK), before he can get to reverse the burden of proof against an alleged infringer". Aaradhana has attached this table, on which she is still working, comparing the provisions governing the reversal of the burden of proof across some important jurisdictions. If any readers would like to contact her with their comments, can they please email her here. Back in 2008, in Les Laboratoires Servier and another v Apotex Inc and others  EWHC 2347 (Ch) (noted here by PatLit), Mr Justice Norris gave a ruling which attracted much interest and some critical comment. To recap, Servier developed and patented a pharmaceutical known as Perindopril (a prescription drug used against hypertension), which it sold as Coversyl. This patent was the '341 patent'. In July 2000 Servier applied for a further patent (the '947 patent') covering an allegedly new form of Perindopril. In July 2006 the European Patent Office dismissed an opposition, so the '947 patent survive unscathed. Generics manufacturer Apotex decided to make Perindopril, considering the '947 patent to be no more than a rehashed version of '341. Servier sued for patent infringement and secured interim relief, restraining importation of Apotex's product. In subsequent proceedings the patent was found to be invalid and was revoked by the court. Since the interim injunction stopped Apotex selling Perindopril for a large period of time, the court had to quantify the entitlement of Apotex to damages under the cross-undertaking given by Servier when the application for interim relief was granted. The problem that led to this little morsel of litigation was that, while the inquiry into damages was edging towards its close, Servier sought permission to amend its case in the light of a finding of infringement against Apotex in the Canadian Federal Court in Canada, in proceedings to which Servier was not a party, this patent being held not by Servier but by an associated company. The point of the application was this: the Perindopril which Apotex would have sold if no injunction had been granted would have been made in Canada and would have infringed the associated company's patent. Norris J dismissed Servier's application on the ground that it was made at too late a stage in the proceedings. The Canadian proceedings actually predated the commencement of the inquiry into damages on the cross-undertaking; the underlying legal point, if valid, had been in existence since the beginning of the inquiry and it had been open to Servier to make the application from the outset -- but it didn't. Norris J added that a party that secures interim relief before failing to establish infringement is not actually a 'wrongdoer', but someone who has obtained an advantage upon consideration of a necessarily incomplete picture. From the court's perspective such a person should be treated as if he had made a promise not to prevent that which the injunction in fact prevented. There had to be some form of symmetry between the process by which he obtained his relief (an approximate answer involving a limited consideration of the detailed merits) and that by which he compensated the subject of the injunction for having done so without legal right, particularly where -- as here -- the paying party had refused to provide full details of the sales and profits which it made during the period when the injunction was in force. For the record, the damages awarded against Servier were assessed at £17.5 million. Servier appealed. Allowing the appeal, the Court of Appeal (Lords Justices Lloyd-Jacob and Sullivan; Sir David Keene) held last Friday that Norris J failed to have adequate regard to the consideration that, refusing to allow the amendment, the court was gifting Apotex the benefit of the £17.5 million awarded as damages as a total windfall. For Apotex, in English proceedings, to be awarded this sum of £17.5 million -- which might be unjustified -- was a very serious matter and the judge's failure to take this into account seriously affected the exercise of his discretion. The Court of Appeal added that, after the judge's decision, the Federal Court of Appeal in Canada had affirmed indeed its own decision. This made it even more likely that Apotex had received an unjustified benefit in England. The amendment was accordingly allowed -- but there was a little sting in the tail: the amendment was only to be allowed on the basis that Servier paid all the costs of the inquiry to date, since it should have raised the matter from the outset. NB: this item is prepared in reliance on a Lawtel note and an earlier weblog post. This decision is not yet available on BAILII. On 4 December 2009 an EU press release was issued which was grandly entitled “Patents: EU achieves political breakthrough on an enhanced patent system". The press release went on: “The Council has today unanimously adopted conclusions on an enhanced patent system in Europe. 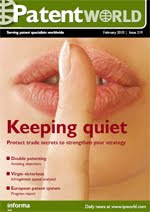 The package agreed covers major elements to bring about a single EU patent and establish a new patent court in the EU. Both together will make it less costly for businesses to protect innovative technology and make litigation more accessible and predictable. Today’s agreement will pave the way for solving the outstanding issues to achieve a major reform of the EU patent system in the near future". The story behind the spin is however that "little real progress has been made on the creation of an improved European patent system". Don't we know it! ... in order to avoid declaratory judgment jurisdiction, I recommend sticking to exactly what the court stated doesn't constitute grounds for a declaratory judgment action: "a communication from a patent owner to another party, merely identifying its patent and the other party's product line". This advice follows a Federal Circuit case that erupted last year after Texas-based patent-holder Acceleron wrote a letter to an alleged infringer, Hewlett-Packard, which only (i) brought the pertinent patent to the attention of HP, (ii) requested a dialogue and (iii) requested a confirmation that no "case or controversy" existed at the moment. Following further correspondence HP filed a declaratory action in Delaware. This did not please Acceleron, which claimed there was no "case or controversy" since it didn't actually threaten to sue or even claim that HP was infringing. The Federal Circuit disagreed with this interpretation of the facts, for the following reasons: (1) Acceleron stated the patent was relevant to HP's product(s) [this is presumably a pretty well ever-present factor in cases in which a patent owner considers that the recipient of the letter is infringing his patent]; (2) Acceleron imposed a short deadline for responding to their letter [this is likely to be interpreted as a litigation-led imposition]; (3) Acceleron insisted that HP not file suit [ditto] and (4) Acceleron was a non-competitor patent holding company [it's not clear to me what weight should be given to this factor. Surely if the parties had been market competitors, the same implication could be drawn that litigation was being contemplated?]. Virgin Atlantic v Premium Aircraft (t/a Contour)  EWCA Civ 1513, a decision at the tail-end of last year from the Court of Appeal for England and Wales (Lords Justices Jacob and Patten, Mr Justice Kitchin), concerned an application for a stay of a damages inquiry and final injunction in light of (i) Contour's application to the Supreme Court for leave to appeal, and (ii) an appeal in European Patent Office opposition proceedings. 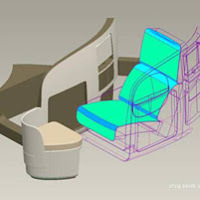 "First and most important is that the infringing seats will not be used in competition with Virgin Atlantic. Second, there is only a limited number of them, 400 when already 2,800 have been supplied. Third, the period of infringement would be very short ... Fourth, there is the significant effect of the £1 million penalty clause [in the contract to supply the infringing seats] which could otherwise bite. Fifth, there is the potential effect on employment. I only give slight weight to this not because people losing their jobs is not a very significant matter for it is. The reason I give slight weight is because the ultimate decision in this case lies with the parent company Seton which is supporting Contour. If jobs are lost it will be the parent company's decision, just as it has been the parent company's decision to support Contour up until now which has prevented job losses until now ...". In Eli Lilly and Company v Human Genome Sciences Inc  EWCA Civ 33 the Court of Appeal for England and Wales (Lord JusticeJacob, Lady Justice Hallett, Mr Justice Lewison) dismissed HGS's appeal against the decision of Kitchin J in 2008 that its patent was void as not being susceptible of industrial applicability under Art.57 of the European Patent Convention (for a note on the technical background to the appeal and a summary of the trial judge's decision click here). Of particular interest in this case is the fact that the claims which the appellate court considered were not the same as those before Kitchin J, which the Opposition Division of the European Patent Office had also held invalid, but the somewhat restricted claims which the Technical Board of the EPO had subsequently accepted following an accelerated proceeding following cooperation with the Court of Appeal itself. 6. Co-operation between national courts and the EPO of the sort which happened between this court and the TBA in this case is mightily to be welcomed. It should, as far as possible, extend to all the stages of procedure in both national courts and in the OD and Boards of Appeal of the EPO. 7. I should enlarge upon that. Far from all oppositions (and appeals) in the EPO are of immediate commercial concern to the parties. Many, perhaps most (it would be valuable to find out), oppositions are started on a precautionary basis only: a potential competitor of the patentee takes the view that although the patent is of no immediate concern to him, it might have an impact on his business at some time in the future. If that is so, unless he is to lose all possibility of a central attack, he must start an opposition before the nine month period from grant expires. So he does. 8. Of course there are cases where the patent may have an immediate and obvious important commercial impact. It is in that class of case, and perhaps only that class, that parallel litigation in the EPO and one or more national courts occurs. Such cases are actually rare considering the total number of patents under opposition in the EPO at any one time. And it is in those cases that the sort of co-operation there has been in this case can be most valuable. 9. Actually it would have been better if the co-operation had started earlier. That probably would have happened if either of the parties has asked for it: neither the OD nor the TBA nor a national court can know that a case needs speeding up unless someone tells them and asks for it. 10. The more the overall opposition procedure can be expedited in the relatively small class of cases of immediate commercial concern, the more significant uncertainty (which is inherently damaging) is likely to be reduced for European industry and business. That needs co-operation from the outset not only between the TBA and the national court (as happened here) but co-operation between the national court(s) on the one hand and the EPO (both the OD and the TBA) on the other. And the parties should actively co-operate too. Commercially urgent and important cases need a fast track. 14. Because we are differing from the TBA I should point out some basic matters of procedure and approach which help explain why. 15. A key rule of civil procedure in England and Wales (and indeed in most if not all common law countries as well as some civil law countries) is that each side must marshal all its evidence (expert and factual) and arguments for the trial court – the court of first instance. 16. The process at a trial in England involves an intensive investigation and testing of the evidence. Each party's witness statements and expert reports must be provided in advance of the hearing. The expert witnesses are generally people who have been closely engaged with the very technical subject matter of the case. Each party's internal documents relevant to the issues in the case (and most particularly the documents adverse to its case) have to be disclosed in advance by the process called by most common lawyers "discovery" but now in England "disclosure". 17. At the hearing the evidence, both factual and expert, is severely tested by the process of cross-examination – the asking of questions by a lawyer from the other side who will have been educated deeply in the art by his own party's expert. An expert's opinion, as such, is treated by the court as of little value. His reasons for that opinion are what matter. Those reasons are apt to be probed without remorse before a tribunal which itself will have developed a good understanding of the technical subject-matter. Because that is likely to happen, expert witnesses in English are less apt to "stretch" things in favour of the party relying on them. They know their reputation is "on the line." 22. The English trial procedure has the very considerable advantage that all parties know that they have to make their best efforts for the first instance decision. Each side has to put its cards on the table. That in itself causes quite a few cases to settle: if the other side has aces and kings and you have only low value cards and you each know broadly what the other has, you had better settle on as best terms as you can get. 23. The system has its problems – particularly in relation to its expense. But in a case of great commercial importance and significance the expense is relatively insignificant to what is at stake. This is such a case. 24. In England and Wales appeals lie from first instance decisions to this Court provided they are adjudged (either by the trial Judge or this Court) to have a real prospect of success. 25. But appeals are conducted on the evidence and materials before the court of first instance. There are no new witnesses, expert opinions, or other new evidential matter save in very exceptional circumstances. The most important of these are where the fresh evidence could not, using due diligence, have been found for use at the trial and even then only when it is likely to have a material effect on the appeal. 27. The upshot is that an English first instance case is "for real". It is not shadow boxing for a real contest later on an "appeal." Not only must a party put its cards on the table prior to the trial, it must find and play all its best cards at the trial. It is noteworthy that the currently proposed rules of procedure about appeals in a future European Patents Court of Appeal are based on essentially the same principle. And that the recent changes of procedural law in hearing about appeals from the Bundespatentsgericht have moved in the same direction. 28. Inherently the procedure is very different and much less intensive. The very name "opposition", given to what is really and in law an application for revocation, indicates something about it: that it is in some sense regarded as part of the grant process rather than a contest before the ultimate arbiter of validity (though it will be that if the patent is revoked). For the same reason the first instance proceedings in the OD are regarded as "administrative" thus making it legitimate to have on the panel the very examiner who allowed the grant of the patent. The link to the grant process also explains the nine-month rule for entering opposition. 29. The opposition procedure represents a compromise. In theory a true pre-grant opposition would be ideal – any patent which emerged would have finished its patent office processing. But true pre-grant opposition can potentially lead to unacceptable delays in enforceability of the patent in national courts (it certainly did in the UK under the old law). So this form of belated opposition was provided as the compromise. 30. In practice, both before the OD and the Boards of Appeal there is much less room for the testing of evidence (both factual and expert) than there is in the English (and indeed some) other national courts. There is no cross-examination (even of a short and controlled nature) and no compulsory disclosure of documents (particularly those adverse to a party's case). 32. Anecdotal evidence from the professions suggests that some Boards are more liberal in their approach to fresh evidence than others. I cannot say whether that is so or not, though it would obviously be unfortunate if it were significantly so. What I can say is that in this case, the TBA permitted further evidence from HGS, amounting to 700 pages, just three weeks before the oral hearing. The material consisted of new technical papers and a declaration of a Dr Kelsoe which the TBA expressly relied upon in two parts of its decision. One is unable to discern whether other parts of the decision were influenced by the new material (though there was express reference to a new paper by Fu), though it is entirely possible - the process of forming a judgment inevitably includes taking into account matters of detail and impression which do not find their way into express reasoning. 33. It follows from the nature of the procedure that inevitably in some respects – particularly those involving the facts and the testing of expert evidence, the EPO, including its judicial organ, the TBAs, is something of a "coarse filter". It cannot, need not and does not investigate matters affecting validity as profoundly as a national court can. And there will inevitably, even if there is no express acknowledgment to that effect, be something of a benefit of the doubt accorded to the patentee who is in some sense seen still as an applicant for the patent. 34. I wish to make it plain that, by saying this, I in no way intend to disparage the most excellent work done by the TBAs, working as they do under the pressure of an enormous caseload. Far from it. Given what they have to cope with they do as well, perhaps rather better, than could be imagined. 35. It remains the position however, that once a patent has been granted by the EPO and survived any opposition, the ultimate arbiter of its validity in any designated Contracting State is the national court system of that Contracting State deciding the case using its own fact finding procedures. Under the EPC system the national courts are the final judges of validity of a patent which has survived in the EPO. The status of EPO and especially TBA decisions on questions of law in National (and especially UK) proceedings. 38. When it comes to legal principles the position of the TBAs (and even more so of course, the Enlarged Board) stands quite differently from its determination of facts or questions of degree. Decisions of the TBAs on questions of law are of immense importance. We do not yet have a European Patent Court to lay down principles through case law. The TBAs (subject to occasional references to the Enlarged Board), albeit that technical members are in the majority, at present are the only body which can perform that function. They will continue to do so unless and until such a Court, staffed principally by lawyer judges, comes into being. Few would say they have done a bad job. Indeed it would not be exaggerating to say that but for the TBAs, European patent law – especially that concerning validity – would not have the coherence, integrity and predictability which it now has. The users of the system have a lot for which to thank the TBAs. 39. In the UK the key importance of the TBAs' case law is well settled. We follow any principle of law clearly laid down by them, only reserving the right to differ if we are sure that the commodore is steering the fleet on to the rocks .... Other significant national courts follow the same principle, as I understand it. For instance the Bundesgerichtshof has just recently applied TBA jurisprudence in its decision corresponding to (and agreeing with) that of the House of Lords in Generics v Lundbeck  UKHL 9 (see the BGH decision of 10th September 2009, Case Xa ZR 130/07 at ). 40. Mr Carr suggested that our courts should go further: if the TBA has not only laid down a "pure" principle of law but has also set a standard by which it was to be applied in a series of cases, we should follow that standard too. In particular he took us to some other TBA cases which he submitted showed the application of a standard which we should follow. 41. I am not persuaded by this. Once one departs from a principle of law and starts trying to consider how a particular TBA applied the legal principles to various sets of facts in different cases, one is inevitably involved in assessing the facts of those cases or what are said to be those facts. The suggested exercise involves comparing the EPO's evaluation of the facts in one or more cases with the facts in the case at hand. I do not see why the English court's intense fact finding and evaluation process should give deference to the findings or evaluations of fact by the TBA in other cases – cases which, as we shall see, the TBA itself regards as fact-sensitive. The English Courts have never, for instance, given deference to the TBAs in the case of the objection of obviousness. I do not see why the position should be different in the case of other fact-evaluation objections such as sufficiency or, here, susceptibility of industrial application". Jury trials for patents: where in the world? "I've reviewed many of the EC's documents to date and (unless I've missed something) cannot find any reference to introducing any triable issues to a jury. Do we believe that no such term will be forthcoming? The current proposal discusses the composition and qualifications of the judges only. I'm in the US, there is a right to jury trial in patent (and other IP cases) on issues of infringement and validity. Is that so in many European states as well?". Offhand I can't think of any jurisdictions in the world other than the United States that have jury trials on issues of validity and infringement, but it's more prudent to check than to give an answer that's wrong. If any reader knows of any such jurisdiction, can he or she please let PatLit know?